Take an adventure tour with one of our outfitters below they know Steamboat Springs and the area and only the best are listed here. Summer Adventure tours in Steamboat Springs area include whitewater rafting from class one for the family or the inexperienced to class five for experienced thrill seeker. Go off roading in the backcountry on a atv, jeep or a 4x4, experience views by horseback, go zip lining, play golf on championship courses, families can enjoy a train ride through the mountains of Colorado, see the mountains from a kayak or go sailing, canoeing or rent a power boat. 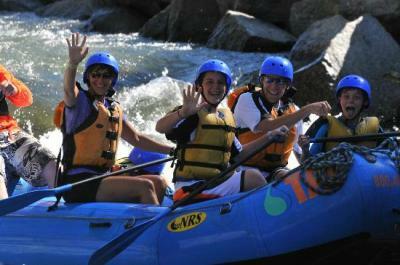 A Steamboat Springs area summer is all about being part of nature check out the outfitters below. Your Steamboat Springs area winter tours get you out in the pristine woods snowmobiling or zip lining over snow covered trees. You always want to add a Steamboat Springs area sleigh ride tour to your visit, enjoy the peaceful surronding as your horse drawn sleigh takes you through the woods. Another great way to spend family time is in the area of Steamboat Springs on a snow coach tour, great for all ages to get into the backcountry. Dog sleding is a must and nothing like it, to get out and mush your team of huskies will bring memorable mountain experiences to take home. Like hiking in the summer then go out and enjoy the crisp Steamboat Springs mountain air with a snowshoe tours in the area, if you can walk you can showshoe. Whatever the area of Steamboat Springs tours you take, remember to bring a camera, dress for the weather, have fun and always smile. An area Steamboat Springs tour is great fun for you to venture alone, bring a friend or loved ones, a family outing, or for a great corporate retreat, there is something for everyone to enjoy in the Steamboat Springs area. Snowmobiling is a safe and exciting sport for all ability levels. We look forward to taking you on the tour of a lifetime!